I’m happy to share my very first collaborative mural project created in collaboration with a wonderful group of kids at Taman Permata Hati Orphanage in Ubud, Bali. Check out April’s downloadable desktop wallpaper calendar, a collaborative painting made by Lynzee Lynx and me. Enjoy. Today I’m sharing about a very special event called, The Gathering of the Creatives, in Santa Fe, September 20 – 22, 2019. I would love for you to join me! One of the most meaningful days of my recent retreat in Bali was our Giveback Day, and I’m so happy a little bit about it with you here. This month’s downloadable desktop wallpaper calendar, featuring one of my original paintings, has arrived! My gorgeous new February Desktop Calendar has arrived! Free download inside just for you. There’s no better time than the present to re-commit to your creativity! Today I’m sharing thirty (totally doable!) Creative Prompts to kick off the new year. YOUR JANUARY DESKTOP CALENDAR IS HERE! Fresh off the presses – your January 2019 downloadable desktop calendar is here! GRATITUDE, GIFTIES, + INSPIRATION IN 2019! Hello, 2019! Today I’m sharing some of my favorite blogs from 2018 to inspire you for the coming year. Today on the blog I share some easy + fun tips on how to make your own customized wrapping paper for those you love! December’s fresh downloadable images to inspire you and your community! YOUR DECEMBER DESKTOP CALENDAR IS HERE! Your December 2018 downloadable desktop calendar has arrived! Enjoy dears. November’s series of downloadable inspiration for you to share with your loved ones! Enjoy this Novemeber 2018 desktop calendar, a gift from me to you. FREE DOWNLOADABLE ART TO SHARE! Today I created a series of downloadable images for you to share and enjoy! Discover one of my key guidelines for my Brave Intuitive Painting process… and an amazing opportunity to paint with me in 2019! YOUR OCTOBER DESKTOP CALENDAR IS HERE! I created this downloadable October 2018 desktop calendar for you to enjoy. It’s free! Come hang out with me! Registration is now open for my very first live online hangout in my backyard art studio. We’ll paint, dance, talk, sip tea… and so much more. If you’ve ever wanted to join me in my studio for tea and a painting session, here is your chance! Join me from the comfort of your own home. Find out more in the blog! I’m a big believer in the power of sharing our personal stories, and I finally feel ready to share this one with you. Thank you for allowing my vulnerability. Behind the scenes of painting and teaching and all that I do, I’ve been on a very tender fertility journey for the past four years. As I moved through the rollercoaster of it all, I felt the need to keep it very private…until now. I created this downloadable September 2018 desktop calendar for you to enjoy. Take a peek! On October 17 – 21, 2018, I’ll be filming a full-length Bloom True Workshop, with all the bells and whistles, and I’m seeking eight wonderful participants to be the stars of the show. YOUR AUGUST DESKTOP CALENDAR IS HERE! I created this downloadable August 2018 desktop calendar just for you. Enjoy! THIS NEW PAINTING TAUGHT ME SO MUCH! I’m excited to share with you today what I learned from painting a new commission, and how this unique challenge helped me see the process in a whole new way. YOUR JULY DESKTOP CALENDAR IS HERE! I created this downloadable July 2018 desktop calendar just for you. Enjoy! If you’ve ever gotten stuck in your head in the middle of the painting process, you’re not alone. Today I’ve compiled some crucial tools to breathe life back into your paintings, so you can move forward courageously and confidently. Today I’m sharing all 17 Hey Flora episodes in one place! Get ready for some serious inspiration and answers to your burning questions inside. YOUR JUNE DESKTOP CALENDAR IS HERE! I created this downloadable June 2018 desktop calendar just for you, featuring my painting “Ripple Effect”. Enjoy! NEW HEY FLORA EPISODE: HOW OFTEN DO YOU PAINT? If you’ve ever wondered how to balance your creative painting practice with your life and business, this “Hey Flora” is for you. In this episode I talk about how I manage my time to keep my cup full of inspiration. I know the act of putting a price tag on our heartfelt creations and sending them out into the world can feel vulnerable and overwhelming. In today’s “Hey Flora”, I share my favorite tips for fairly pricing your artwork. 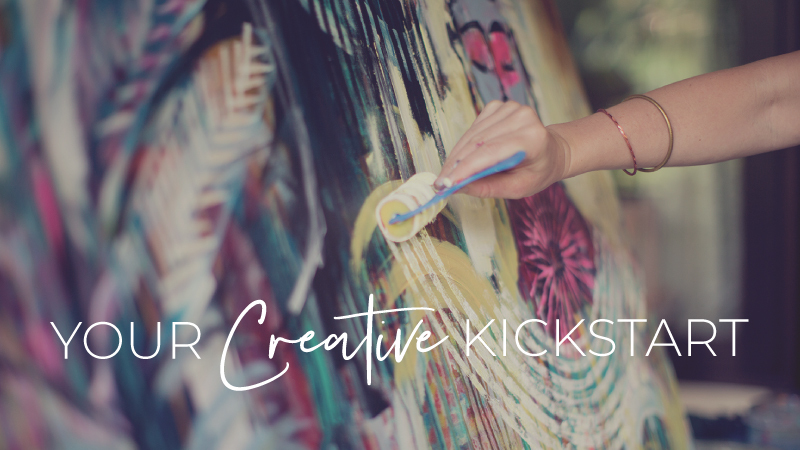 If you are wondering how to balance imagery you’ve found in life while staying open to inspiration and change in the Brave Intuitive Painting process, this blog is for you! In the last couple weeks, I did two Live Q + A Sessions where I answered all kinds of fun questions about the creative process, art business, inspirations, offerings, and ya know, important things like my favorite shoes. Watch them here! A CRUCIAL TIP TO FINDING YOUR STYLE + SOME OF MY FAVORITE ARTISTS! Have you ever wondered how to “find inspiration” from someone else’s art without copying or being overly derivative of their style? This is a great thing to think about! In this blog I talk about some of my favorite artists inspiring me right now, and how to cultivate your own personal style that sources inspiration while being uniquely yours. Creativity is one of those things that requires you to step into some pretty uncharted territory, often with no plan at all. So, of course, you’re gonna be a little nervous — anything can happen out there on the wilds of your canvas! Today I’ll share with you some tips I’ve learned over there years that will hopefully breathe some fresh confidence beneath your creative wings. Aloha! I had the great fortune of spending the past two weeks filling my cup in beautiful Hawaii, and I’m happy to share some of the blessings I received along the way. ONE SIMPLE TRICK TO BRING YOUR PAINTINGS TO LIFE! If you’re feeling in a rut with the imagery or shapes you’re using in your paintings, I’m happy to share one simple trick that might change everything. I remember the exact moment this concept occurred to me. It was about fifteen years ago, and I was out walking on my birthday with my sketchbook. Read the rest of the story in the blog! Today’s the day I get to introduce you to Niema Lightseed, one of the most gentle, soulful, and authentic women I know. Niema’s course, Medicinal Poetry: Using the Healing Art of Writing to Activate Your Inner Muse is the very first offering featured in The Collective, and it feels like the perfect way to kick off this new collaborative adventure. I know you’re going to love her. It’s time to lift each other up! I meet so many amazing souls who have something truly unique to share. However, they often lack the practical bits like video equipment, an online platform, or an audience to receive their gifts. For years, I’ve dreamed about how I could collaboratively support these women to bring their extraordinary messages to a larger audience. Today I’ll talk about my newest online offering! Looking forward, I’ve been asking myself how to offer something that feels truly useful and inspiring, while also honoring my need for creative freedom, spaciousness and rest. I’ve come up with something that feels like the perfect solution. I’m calling it Real Time, and I made a little video to give you the scoop. Check it out here! I cherish the days at the end of each year to reflect on all that’s transpired over the past twelve months and to consciously plant new intentions for the coming year. To honor this past year, I’m happy to share a few of my favorite creative tidbits, videos, interviews and downloadable PDFs from 2017. Friends. I’ve noticed something about humans these days, and I’m guessing you’ve noticed it too. Whenever we have a spare moment that’s not filled with some kind of stimulation, we reach for our devices to fill the space. I’ve been working hard to set up new boundaries and create healthier patterns around my relationship to technology, and I’m happy to share some of my tricks with you today. Today I have a little gift for you. My amazing right-hand gal, Tina, had the brilliant idea of creating some free downloadable gift tags for you, and voila — here they are! If you’ve ever wondered how, or if, making art and flexing your creative muscles contributes to the world in a truly impactful and meaningful way, you’re not alone. Watch the video to hear about the breakthrough I recently experienced when teaching a workshop in Northern California. In this session, I added some spice to my painting process by creating a “Painting Prompts” game. As a result, the painting went through many interesting incarnations and eventually turned into something truly special and unique. Watch the video inside for sneak peek of the process! Desha Peacock joins us for a guest blog today to share some tips on how to create a space to do your art, even if you have a small space. In her new book, Your Creative Work Space, she interviewed Flora to learn how she’s created her own sweet spot work space, plus she’ll share some more sage advice from other creatives that were featured in the book. MY BIGGEST PAINTING SALE TO DATE! I’m getting ready to move into my new backyard studio, and this means I’m clearing house! I honestly haven’t put much effort into selling my original paintings for the past seven years, so this is a pretty rare and exciting moment in Flora history. In this Session, I explore something I’ve been inspired to try for some time, and the process results in a big breakthrough! If you’re curious about adding more mixed media elements and personal ephemera into your paintings, this Session is a must watch. I BELIEVE CREATIVITY CAN SAVE THE WORLD. HERE’S WHY. As I watch the incredible turbulence gripping the planet right now, I find myself dreaming about a radically different kind of future – one where our Earth is in balance and all living beings are treated with dignity and respect. This is where creativity comes in. Read more in my blog! I’m teaching a brand new course on Life Book 2018! Registration for Life Book opens on September 12. The giveaway is now over – thanks to all who entered!